Ravenna is like no other place in Italy, and the magnificence of its mosaics will leave you breathless - and with a stiff neck. Although Ravenna's port was already important as the base of the Roman Adriatic fleet, it reached even greater heights when Emperor Honorius moved his court here from Milan in 402, making Ravenna the capital of the entire Western Roman Empire. Honorius and his sister, Galla Placidia, embarked on a building program and established the city as a center of mosaic art to embellish their new churches. It continued as the seat of sixth-century king Theodoric the Great, who had been brought up in Constantinople, and later, the seat of a Byzantine governor, so the artistic influences here were heavily Byzantine. Intricate mosaic work achieved some of its greatest heights here. An astonishing amount of exquisite mosaics survive, most of them in seven buildings that form, along with the Tomb of Theodoric, a UNESCO World Heritage Site. The greatest danger is becoming overwhelmed by the sheer magnitude of mosaics, so that by the time you reach the last places, you simply cannot absorb any more. For this reason, it's a good idea to plan your visit over two separate days. But however you see Ravenna, you'll agree that it is unique among all the places to visit in Italy. A good place to begin, both geographically and historically is this early fifth-century brick baptistery in the heart of the city. The octagonal building is one of the oldest in Ravenna, and considered to be the finest and most complete example of early Christian baptistery surviving today. Intricate mosaics line its entire dome, culminating in a large mosaic medallion at the top picturing the Baptism of Christ by John the Baptist. Don't be misled by the plain, somewhat drab exterior of San Vitale; the interior more than makes up for it. Step into the octagonal church, built in the first half of the 6th century, and behold one of the most important examples of early Christian Byzantine art and architecture in Western Europe. Apart from a few Baroque frescoes added to the dome, the entire decoration is in mosaic, but the height makes its tiny tesserae blend together (as the artist intended) so they look like paintings. Only the luminous colors and liberal use of gold betray their secret. The 6th-century mosaics in the choir apse portray Justinian, his wife Theodora and their court; Christ is shown flanked by St. Vitalis (on the left) and St. Ecclesius. These mosaics are the largest and best preserved display outside of Constantinople itself. From the soaring, bright, and almost overwhelming grandeur of San Vitale, step into the intimate afterworld of Galla Placidia, sister of the Emperor Honorius. It will take your eyes a minute or two to adjust to the dim light filtering through windows of sliced translucent agate into the vaulted cross-shaped mausoleum. The low arches and domes are lined with fifth-century mosaics made of the tiniest of tesserae, the figures in contrast against a deep blue background. Over the door, Christ appears as the Good Shepherd, surrounded by mosaic sheep. Look for the apostles and for symbols of the four evangelists - the lion, eagle, ox, and angel. The marble sarcophagi are thought to be those of Galla Placidia, her husband and son, all of whom died in the fifth century. The UNESCO citation calls this "the earliest and best preserved of all mosaic monuments, and at the same time one of the most artistically perfect." The walk across town to Sant'Apollinare Nuovo not only gives you time to rest your eyes, but to skip to the 6th century, when Theodoric had this basilica built as his cathedral. The walls of the long single nave are decorated with mosaics showing ships in the nearby Roman port of Classis on the left, and on the right Ravenna, with its churches and Theodoric's palace. Take advantage of the chairs along the wall to look up at the mosaics high on the walls above, showing saints, prophets, and New Testament scenes. Before leaving, step into the cloister to see the fascinating exhibits on the creation of mosaics, where you can see the materials and techniques, along with samples of the almost infinite gradations of color the artists work with. Adjoining San Vitale, the museum housed in the cloisters of the former Benedictine Monastery has excellent collections of carved ivories, textiles from the Coptic to Renaissance periods, icons, and ancient weapons. Particularly interesting is a cycle of 14th-century frescoes of Santa Chiara from the convent church of the Poor Clares in Ravenna. Near the cathedral and Neonian Baptistery is the Archbishop's Palace, inside which is the Archiepiscopal Chapel, one of the eight Ravenna attractions cited by UNESCO. The bishops' private oratory, built around the turn of the sixth century, is in the shape of a Greek cross. The lower walls are covered in marble, above which are mosaics. Also in the palace, a small museum holds a sixth-century Egyptian throne with reliefs of carved ivory. When your eyes and neck weary of mosaics, give them a rest by walking to Ravenna's only UNESCO-cited attraction without a single tessera. At the north end of Via Roma stands the early 6th-century tomb Theodoric planned for himself, a monumental two-story rotunda. This remarkable piece of late Roman architecture is built of marble and capped by a single stone more than 10 meters in diameter, weighing around 3,000 tons. The walk is about 800 meters, but you can also take bus number 5, 18, or 90 from the railway station. The small octagonal brick baptistery that Theodoric built next to his cathedral later became an oratory dedicated to the Virgin Mary called Santa Maria in Cosmedin. Although part of the UNESCO site, the remaining sixth-century mosaics in the dome depicting the Baptism of Christ have been greatly restored over the centuries. Surrounding the baptismal scene are mosaic images of the Twelve Apostles and a throne with a cross. About six kilometers south of Ravenna's center on the road to Rimini, the imposing round campanile of Sant' Apollinare in Classe stands high above the flat landscape. Built in the mid-sixth century, just outside Ravenna's ancient Roman port of Classis, the church is decorated by the last examples of the city's mosaics, commissioned between 673 and 679. These add to the earlier mosaics completed when it was built. If you think you've seen the panel in the apse showing the commissioning bishop Reparatus with Emperor Constantine IV before, you have: it is clearly imitating the one of Emperor Justinian in San Vitale. In the aisles, marble sarcophagi of archbishops show the changes in styles between the fifth and eighth centuries. Notice the bronze window-grating in the crypt. For a historical treasure hunt, look for the ancient pagan tombstones that were reused in the church's construction. Northeast of Sant' Apollinare, near the station, which suffered heavy damage during the Second World War, the church of San Giovanni Evangelista was founded by Galla Placidia in 424. Unfortunately, bombs aimed at the train station destroyed much of the church, but it was rebuilt in its original form after the war. It still has many original features, including most of the columns and their carved Byzantine capitals. Many of the early mosaics had been lost to renovations in the 16th century, but many of those completed in 1213 still survive. Mounted on the walls are mosaics depicting mythical animals, medieval stories, and historical scenes. Look in the left aisle for a chapel with fragments of 14th-century frescoes on its vault, which have been attributed to Giotto, but are more likely by a Rimini artist of the same era. Palazzo Bezzi: mid-range pricing, stylish white decor, floor-to-ceiling windows, fitness center. NH Ravenna: four-star hotel, short walk to city center, free breakfast buffet. M club Deluxe B&B: affordable bed and breakfast, family run, wonderful hosts, quaint decor. B&B Hotel Ravenna: budget hotel, outskirts of town, bright and contemporary, multilingual staff. 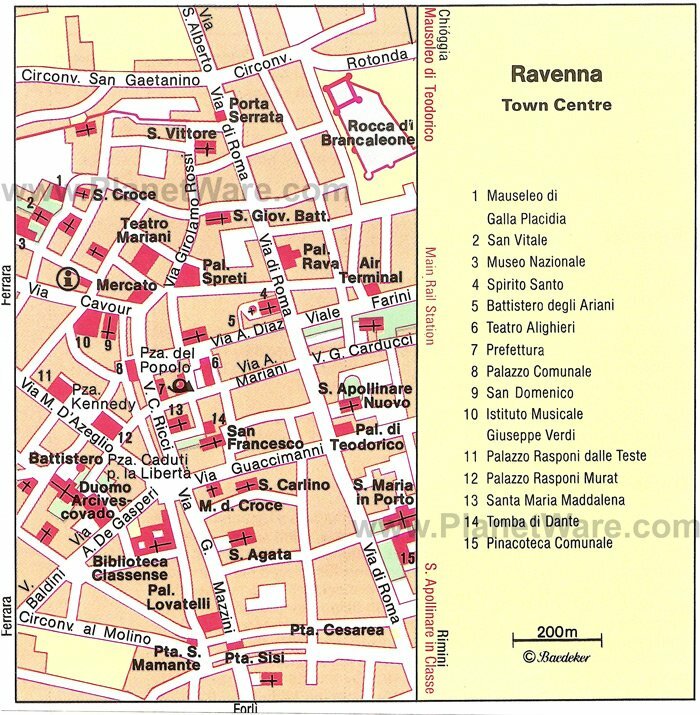 Tours of Ravenna's Mosaics: The Ravenna 3-Hour Private Walking Tour is a good introduction to the highlights of this fascinating city, led by a professional guide who can customize the itinerary to your own interests. The tour includes the three primary mosaic sites: the Church of S. Vitale, Mausoleum of Galla Placidia, and the Neonian Baptistry, along with Dante's tomb, the Basilica of San Francisco, the Basilica of Sant'Apollinare Nuovo, and other sights. For a more in-depth look, also with a private guide, try the Ravenna and its Enchanting Mosaics Full-day Tour. This tour allows for a more leisurely look and a more historical background for the same attractions, plus a visit to the church of San Giovanni Evangelista. About an hour drive from Bologna and the same distance from Ferrara, Ravenna is also within easy reach of the principality of San Marino, Rimini, and some of the best beaches in Italy along the Adriatic Sea. To the west, just beyond Bologna, is Modena and continuing north from Ferrara, you'll find Padua and Venice. South of Bologna is Florence, in beautiful Tuscany.